Next time you are looking for a new outdoor activity, follow your stomach. Not only is foraging free, you'll return home with free food, too! Before setting out, it's important to do some foraging research. You don't want to end up eating something gross, or worse, poisonous. Get informed and start out by going in search of a couple of specific items that grow in your area. With a little practice, you can find a variety of herbs, edible flowers, and even delicious mushrooms. Connect with other local foragers to get tips and learn where to look. You can even practice foraging if you live in a city! For the ultimate in outdoor exercise and adventure, go on a hike. Hikes come in all shapes and sizes, from short, leisurely affairs on well-maintained trails, to intense up-and-down treks that are off the beaten path. Some lead to waterfalls or canyons, while others traverse hilltop neighborhoods. Start by researching hikes people are doing in your area. Decide what intensity you're up for, pack necessary supplies like water, and consider going with a friend or two. Many cities and colleges have hiking groups that meet up regularly to try different routes, and some parks even offer free guided hikes. If you're an experienced hiker, try something different, like a full moon hike. It's easy to overlook the amazing variety of birds in our surroundings, but there's a good reason that bird watchers are so passionate about their hobby. Study up on local species online or at the library, and take a walk through the wilderness or a park to experience the startling diversity of this fauna first-hand. Start with a few common species, making it your goal to spot them while on your first expedition. There are Audubon centers in most cities and in some parks, frequently offering free resources like talks, guided nature walks, and binocular rentals. 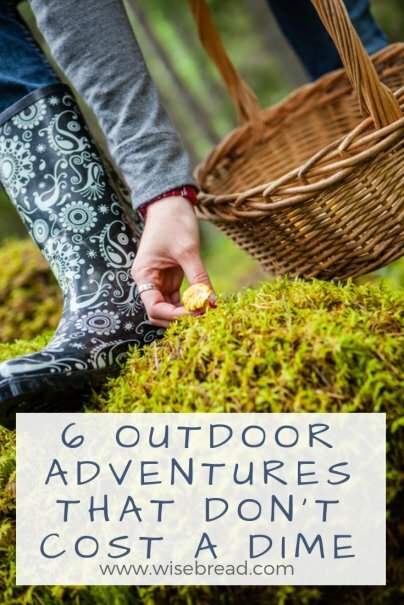 Chances are you've already got the items needed for a fun outdoor game. Take your bike out for a spin on a new route. Grab some friends, scraps of cloth (cut from old t-shirts or a sheet), and play a game of capture the flag. Cut the cloth smaller, and find yourself a football for a game of flag football. Use a round ball to play kickball, or gather various smaller balls to play bocce. Ask your friends what items they have available and pool your resources to play any number of games. It's a great way to spend a sunny day in the park or someone's backyard. How often do you stop and really look up at the night sky? It can be a beautiful and humbling experience, and is further enriched by a bit of knowledge. Find a star chart for your location and the appropriate month, perch yourself on a good vantage point, and see what stars you can identify. There are a few night sky apps with free versions that help you identify stars by pointing your smartphone at the sky. If you are astronomically inclined, check out your local observatory. They frequently have free programs and many host regular star watching groups where you can peer through a telescope zoomed in on current points of interest. If you own a smartphone or GPS and feel like having a bit of an adventure on your own, try geocaching. This is basically a tech-savvy scavenger hunt, featuring items hidden all over, especially in major cities. Just open up the app and see if there are geocaches near you. Use your GPS to navigate and get ready to hunt for your chosen geocache. Once you've found a geocache, explore what's hidden inside, sign your name in the log, and share your experience online. The app is free, and more advanced geocaches are available with a paid upgrade. What free outdoors adventures do you enjoy? Star gazing would be one of my favorites. But as a guy I think the experience is a lot better when there is a special someone with you gazing the endless space. I love trekking! I think the Collegiate Peaks probably the most amazing experience. I went trekking on Mt. Princeton (Chalk Cliffs) a couple of months back.